NEW BEDFORD, Mass. 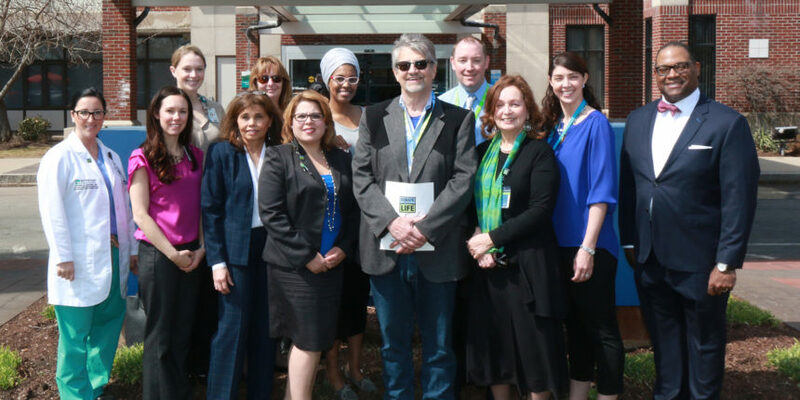 — Southcoast Health today held a flag-raising ceremony at St. Luke’s Hospital in New Bedford to recognize National Donate Life Month, and to celebrate all those individuals who have given the gift of life to others by choosing to be an organ donor. In 2016, Southcoast Health had 12 donors save 41 lives through organ transplant. “These patients made the very courageous decision to help others by checking off the small but very significant organ donor box on their driver’s license or a very difficult and compassionate decision was made by the loved ones in hopes of a positive outcome during a time of devastating loss,” said Renee Clark, COO of Southcoast Hospitals Group, who led today’s event. From this day forth, in memory of the individual who gave the gift of life to others, Southcoast Health will fly the New England Donor Services flag on the last day of each month at the respective site where an organ donation has occurred. The need for organ donors across the country remains significant. According to the U.S. Government Information on Organ Donation and Transplantation, there are currently more than 119,000 men, women and children on the national transplant waiting list. Unfortunately, 22 people die each day waiting for a transplant. National Donate Life Month (NDLM) was instituted by Donate Life America and its partnering organizations in 2003 with the support of then Secretary of HHS, Tommy Thompson. Celebrated in April each year, NDLM features an entire month of local, regional and national activities to help encourage Americans to register as organ, eye and tissue donors and to celebrate those that have saved lives through the gift of donation. The initiative rallies every donor hospital and transplant center, as well as all recovery agencies, to collectively fly the Donate Life flag during April. Many partnering hospitals choose to fly a Donate Life flag throughout the year every time a donation occurs at their centers. The concept is to make a very visible and unified statement about the importance of donation and thus reflect the dire need for donors and encourage people to register their donation decisions.